As computing devices have become more powerful, the trend has been toward more "fluid" user interfaces - interaction models that flow smoothly from one state to another. This differs from earlier approaches where resources were more limited and interactions tended to be Spartan and isolated from each another. Some of the motivation behind an increased focus on fluid UI is almost certainly the "wow" factor; modern interfaces can be quite attractive and fun to use! But there's also scientific research to back this up: people tend to find smooth transitions less disruptive to their workflow than abrupt ones - and the animation itself can help tie the "before" and "after" states together by showing how one becomes the other. With that in mind, one of the things I've wanted to do is apply this principle to enhance the user experience for Silverlight applications on the Windows Phone platform. Specifically, I wanted to make it easy for developers to animate the orientation change of an application that occurs when the phone is rotated from its default portrait orientation to landscape. This is one of those cases where a picture is worth a thousand words, so I've created a short video showing the default behavior of a Silverlight-based Windows Phone application when the device (in this case the emulator) is rotated. For people who have never used the emulator: those two buttons I click rotate the device one quarter turn clockwise or counter-clockwise. I begin by rotating counter-clockwise once, then clockwise once back to the starting orientation, then clockwise three more times to loop all the way around. What I show above is what you get for free when you create a new application - and it's great the device and platform support dynamic orientation changes without any special effort! But I thought it would be cool if I could extend that just a bit in order to animate those orientation changes - again, without requiring the developer to change anything (beyond a couple of superficial name changes). The custom rotation behavior is made possible by the AnimateOrientationChangesPage class I created which works by lying to the layout system (Now, where have I heard that before?). It's a small, self-contained class you insert into the default hierarchy and then never need to worry about again. AnimateOrientationChangesPage automatically gets involved with the necessary steps for rotation and even handles page-to-page navigation changes seamlessly. My goal was to make it easy for Windows Phone applications to offer the kind of fluid rotation experience that's becoming common these days - and it seems like AnimateOrientationChangesPage does that. I hope you find it useful! If you download the sample, please be sure to open MainPage.xaml in the development environment before hitting F5 to run it - otherwise deployment to the emulator might fail with the message "Object reference not set to an instance of an object." because of a bug in the tools. Add the AnimateOrientationChangesPage.cs code file to the project/solution. Run the application and enjoy the animations! These directions enable the default animation behavior which I've configured to use a 0.4 second duration and a reasonable easing function. 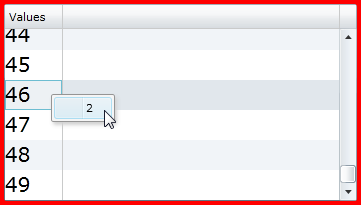 However, if you'd like to customize things further, you can set the Duration property to a different TimeSpan and/or change the EasingFunction to the IEasingFunction implementation of your choice. Just in case, there's also an IsAnimationEnabled property that can be set to false to disable orientation change animations entirely. These properties can be set at any time; the new values take effect at the next orientation change. I reserve the right to change my mind and move some of this code up into a PhoneApplicationFrame subclass if it turns out that would be helpful. :) But for right now, the current implementation seems pretty effective - I've specifically tested it with navigation scenarios and it works well there, too. If you watch the video of the default behavior closely, you'll see a brief period of time right after the rotation occurs where the emulator is rotated but the screen isn't. I think this is an artifact of how the emulator works and doesn't represent something users would see on a real device. As it happens, I don't see that same glitch in the video with AnimateOrientationChangesPage enabled - but I'd apply the same caveat there, too. I've deliberately not supported the PageOrientation.PortraitDown enumeration value. This is not because it would be hard to do (it's quite trivial, actually), but rather because no device I've seen (including the Windows Phone Emulator) actually supports flipping completely upside down in portrait orientation. If this design decision is a problem for your scenario, full PortraitDown support requires only three trivial case statements to implement that will be obvious from looking at the code. My last post talked about the upcoming MSDN blogging platform upgrade. That upgrade took place during last week and new posts/comments for this blog were consequently disabled. Thank you for your patience - I hope you enjoy the new blogging platform! The administrators of the MSDN blogging platform are performing a software upgrade and will be putting all blogs into read-only mode on Sunday, May 16th. New posts and new comments will not be possible for this blog during the transition. The upgrade is expected to finish by Monday, May 24th - but difficulties during the migration could push that date back. I'll post a quick note once the dust has settled and things are back to normal. In the meantime, you should be able to contact me using the old platform's email form. Alternatively, I can be reached on Twitter as @DavidAns. App building is a great way to get exposure to parts of the product you don't normally deal with and can help give team members a more complete view of the platform they work on. I had another app building opportunity recently and my goal was to create a utility application I've been wanting for a while. Did you ever want an easy way to transfer files between two machines on semi-isolated networks (ex: home and work)? Looking for an easier way to publish content to the web? Tired of sending yourself files as email attachments all the time? Sneaker-net got you down? Well, your dreams have just come true! BlobStore is the hot new craze that's taking the world by storm. It's a small, lightweight Silverlight 4 application that acts as a basic front-end for the Windows Azure Simple Data Storage and the Amazon Simple Storage Service (S3)! Just run the BlobStore app, point it at a properly provisioned Azure or S3 account (see below for details on provisioning), and all of a sudden sharing files with yourself and others becomes as simple as dragging and dropping them! BlobStore makes it easy to manage your files by providing a feature-rich (okay, that's an exaggeration) interface that allows you to view, download, or delete files and copy their URL to the clipboard easy-peasy. Logon credentials are stored on your machine so there's no need to remember long account passwords - once you've connected once, future connections are simple and painless. If you download right now, you'll also get the complete source code from which you can explore all the inner workings of this life-changing application. Included with every code download is a free REST wrapper for basic Azure and S3 blob access that handles all the tricky Authorization header details for you. It's almost guaranteed to make your next Azure/S3 application a snap to develop and a wild success in the marketplace. In addition to supporting Azure and S3, BlobStore allows you to use Silverlight's isolated storage for the blob service. This works fine for playing around and general experimentation, but it's important to note that the web browser isn't able to download from isolated storage, so files "uploaded" to isolated storage can't be "downloaded" with the browser. Access to an isolated storage "account" requires a non-empty account name and key - any name and key will work. Isolated storage support is present only for testing purposes (and so people without a provisioned account can play around); I haven't verified that BlobStore works well if access to isolated storage has been disabled or runs out of space. Despite my Silverlight Toolkit pedigree, BlobStore uses no Toolkit or SDK controls - it's 100% core framework-y goodness! 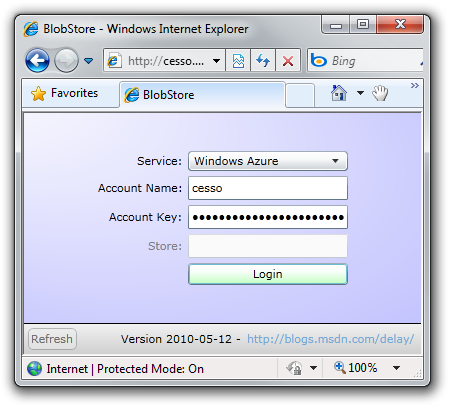 Before BlobStore can access an Azure/S3 account, that account needs to be provisioned to allow access by a Silverlight browser-based application and permit unauthenticated third parties to download content. Steve Marx has a great overview of provisioning an Azure account - the basic steps are to create the special $root container, make it world-readable, and upload a clientaccesspolicy.xml file that lets Silverlight know the cross-domain access is okay. For an S3 account, the concept is the same, but the implementation is a bit simpler - just upload a clientaccesspolicy.xml file and make it world-readable. BlobStore was a fun project to work on and it gave me some nice exposure to Silverlight's networking stack (which I don't normally get a chance to use). There are some rough edges I didn't get around to smoothing over, but on the whole I think BlobStore turned out pretty well: it's small and quick to download, easy to use, it simplifies something I do every day, and it was a great learning experience! Working from an internal reproduction of the problem Brian Braeckel created, I found that I was able to simplify the scenario significantly - to the point of removing ContextMenu and DataGrid entirely! Signs were pointing strongly to this being a bug in the Silverlight framework, but before I started crying wolf, I wanted someone to review my work to be sure I hadn't over-simplified things. Fortunately, RJ Boeke was around and not only confirmed the validity of my repro, but also pointed out further simplifications! If a Binding points to an element via its ElementName or Source parameters and the DataContext of a parent of that element changes, that change will NOT be propagated through the Binding. However, if the DataContext of the element itself changes, the change will be propagated correctly. RJ and I were both kind of surprised to find this bug in Silverlight 4, but when Sage LaTorra looked into this from the QA side, he reported the same problem with Silverlight 3. Which - in a weird kind of way - is actually good news because it means things haven't gotten worse with Silverlight 4 and existing applications won't break unexpectedly! Unfortunately, the DataGrid+ContextMenu scenario relies on this exact behavior to work correctly... When a ContextMenu is about to be displayed, a Popup is created, the menu UI is added to it, and it's shown. Because the Popup isn't in the visual tree, the ContextMenu won't see the right DataContext by default - so it sets up a Binding with its Source set to the ContextMenu's owner element. This works well and the DataContext then "flows" into the Popup where MenuItems can see it and bind to it successfully. The problem in the DataGrid scenario arises when DataGrid decides to recycle one of its rows by swapping one DataContext for another. Though this is a perfectly legitimate thing to do, it runs afoul of this bug and breaks the scenario. Pretty similar, huh? The way this works is that the DataContextPropagationGrid class derives from Grid, listens for DataContext changes in the usual manner, then uses the fact that changes to the local value of DataContext work to "re-broadcast" the change to any Bindings targeting it via ElementName or Source. The important thing to note is that any Binding broken because of the underlying platform bug needs to be pointed at the DataContextPropagationGrid wrapper instead - and should then behave correctly. Aside: I haven't historically considered Grid for workaround scenarios like this. However, it seems like a good fit: Grid can be wrapped around nearly anything without side-effects, it allows multiple children for scenarios where that might be necessary, it's familiar to developers and designers, and it keeps the workaround code simple! If you run into this Silverlight bug in the DataGrid+ContextMenu scenario, please apply the DataContextPropagationGrid workaround and things should work properly. And if you happen run into the bug in some other scenario, the good news is that the DataContextPropagationGrid workaround should work there, too! Just be mindful to point the Binding's ElementName or Source at the DataContextPropagationGrid element, and you're good to go. /// Initializes a new instance of the DataContextPropagationGrid class. /// Identifies the InheritedDataContext DependencyProperty. /// Handles changes to the InheritedDataContext DependencyProperty. Last week saw the release of the Windows Phone Developer Tools CTP - April Refresh, a free set of tools and an emulator that lets everyone get started writing Windows Phone 7 applications. 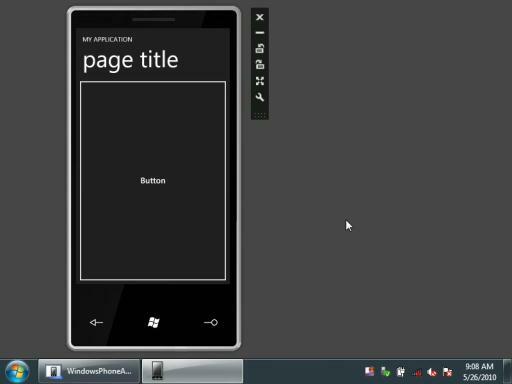 Not only is the application platform for Windows Phone 7 based on the same Silverlight framework many of us already know and love, but the tools run on any standard Windows machine and the inclusion of the device emulator means you can test apps on the device without having a device. It's a great developer story and I'm a big fan! Downloaded source code from my blog, unblocked the ZIP file, and extracted its contents. Opened DataVisualizationOnWindowsPhone.sln in Visual Studio - which immediately showed a message that I was using a solution created with a previous release of the tools and listed a specific change that needed to be made to one of the files. I tried running the application, but got a blank screen in the emulator and the dreaded FileLoadException that results from a bug in the April Refresh where it fails to run any application referencing an assembly with a digital signature. The System.Windows.Controls.DataVisualization.Toolkit.dll assembly used by the sample is from my Developer Release 4 which I build myself and don't sign, but the System.Windows.Controls.dll assembly it depends on is from the November 2009 Silverlight 3 release of the Silverlight Toolkit and is signed. So I stripped the signing from the Silverlight Toolkit assembly using the steps Tim Heuer outlines in this blog post and replaced the signed assembly with the unsigned version I'd just created. Aside: Yes, this is super-goofy - but I'm told it's going to be fixed! Having done that, I tried running the application again, but got the error "Object reference not set to an instance of an object.". But because I ran into that same problem with the previous tools release, I knew to open MainPage.xaml in Visual Studio and try running the app again. 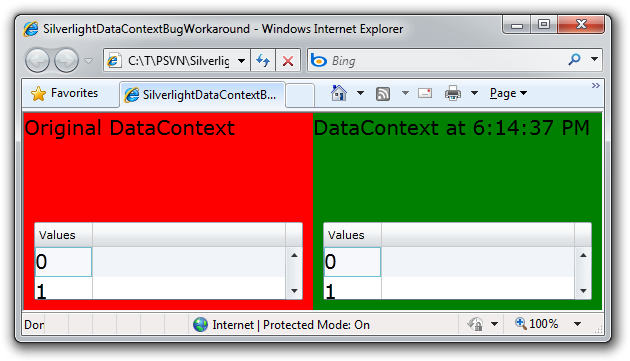 A few days ago, Martin Naughton and Tiago Halm de Carvalho e Branco independently contacted me to report a problem they were having with the new ContextMenu control in the April '10 release of the Silverlight Toolkit. In both cases, they were toggling the IsEnabled property of a MenuItem directly and reported that the control's visuals weren't updating correctly. I was a little surprised at first because I knew I'd tested dynamic changes to the enabled state and I'd seen them work properly. But once I created a test project to investigate the report, I saw how the problem scenario was different. Fortunately, there are some easy workarounds! +        /// Called when the IsEnabled property changes. /// Changes to the correct visual state(s) for the control. By changing the IsEnabled scenario into an ICommand scenario, MenuItemIsEnabledWorkaround sidesteps the bug and saves the day! I've created a sample application to demonstrate the use of the last two workarounds in practice. It contains a simple ContextMenu with three MenuItems and toggles their IsEnabled state every second (whether the menu is open or not). You'll see either of the last two workarounds is enough to keep the corresponding MenuItem's visual state up to date. It's never fun when a bug sneaks by you. :( But it is nice when there are a variety of good options that don't involve jumping through hoops to implement. If you've run into this bug, I apologize for the trouble - and I hope these options help get you going again!